There is no doubt George Clooney is one of the best actors of his generation. And when you team him with people like Tilda Swinton, Tom Wilkinson, Sidney Pollack, Ken Howard and Michael O’Keefe, you expect some performance fireworks. Shame they were wasted on Michael Clayton, a by-the-numbers legal thriller which has been done before and done better. The plot is simple: Big law firm is defending huge multi-national corporation which is involved in class action lawsuit over something they probably did wrong and are attempting to hide it. 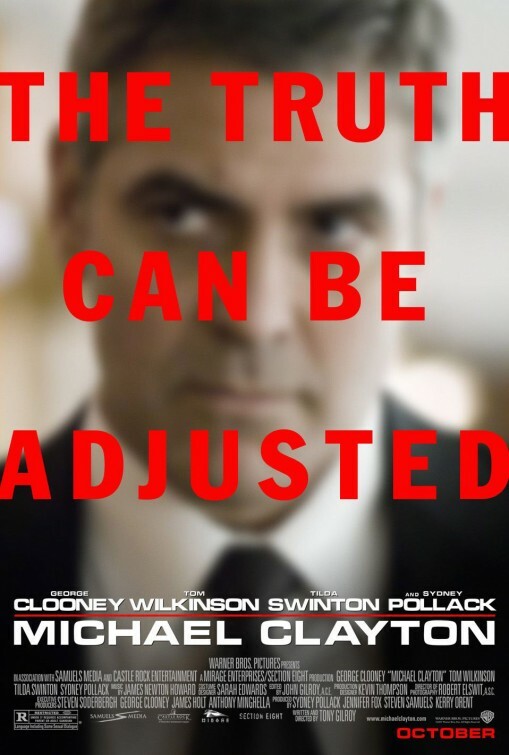 Michael Clayton (George Clooney) is the firm’s “fixer,” the guy they send in to clean up the messes left behind and here, he realizes, for the first time, the firm he works for might be on the wrong side. We’ve seen variations on this theme for years, from Erin Brockovich (know-nothing secretary discovers evidence has been withheld) to Class Action (father and daughter fight it out while withholding evidence), the problem here is we never get the tension these other films delivered. We never fear for Clayton’s life or that he’ll do the wrong thing. In fact, in the first five minutes we are shown that Clayton a) may not be that good at his job and b) he escapes a car bomb. THEN we go back four days so everything can be explained. I’m sorry, and I’m not giving anything away here, but when we see him escape the car bomb before the plot even begins to take shape, when it comes back around we kinda already know he’s gonna escape. The problem seems to be writer/director Tony Gilroy really wants to make a chess match of a film and instead he’s crafted a very fine game of checkers. There’s just not a lot of depth here. It’s a straight forward, pedestrian plot and even the attempts to bring some familial drama (in the form of Clayton’s dysfunctional family) fall well short of adding any type of gravitas. Instead, they feel like tacked on elements placed there strictly to become plot fodder later on, which is interesting since a number of characters also suffer from idiot plot syndrome. There are several incidences where these very smart, very powerful lawyers don’t ask simple questions, questions which would make everything go much smoother. By the end, though, we finally get to see Clayton do what we’ve been told all along he’s very good at – namely, making a problem go away. But by this point, all we can do is wonder where this hard-ball playing tough guy came from, since he’d been in hiding the previous two hours. That all said, this really should have been wonderful film. Tony Gilroy was given an exceptional cast. The performances are all spot on. Tilda Swinton, though, should get a special shout out since she is given the least to work with, character-wise, and yet comes off as the most affected by the story’s chain of events. Gilroy, who is making his directorial debut here, was the responsible writer for all three of the recent Bourne films, which have everything this film is missing. As a writer, it seems like he is better playing in someone else’s sandbox – most of his noted films were adaptations of books. As a first time director, I have to wonder if this film suffers from a too-many-cooks mentality – two of its stars and one of its producers are all themselves award-nominated directors. While Gilroy was setting up a shot did he have Clooney or Pollack whispering in his ear? I’m looking forward to Gilroy’s next film, one where he has a little more confidence in himself and working from source material he loves. That film will be the game this one should have been.